For the Taino fertility goddess, see Atabey (goddess). 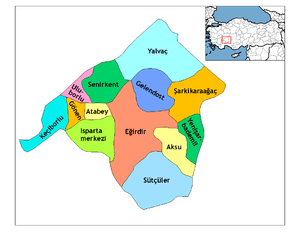 Atabey is a town and district of Isparta Province in the Mediterranean region of Turkey. The mayor is Ali Bal (MHP). The population is 4,153 as of 2010. This article is issued from Wikipedia - version of the 9/29/2013. The text is available under the Creative Commons Attribution/Share Alike but additional terms may apply for the media files.